You're probably familiar with the image of Longhorn cattle. They're a symbol of Texas and the Old West, and in fact are known as Texas Longhorns. Although breed numbers dropped precipitously by the 1920s, the U.S. government had a hand in preserving this uniquely American breed by establishing refuges in Oklahoma and Nebraska. Today, the Texas Longhorn is in demand once again both for its beef and as a cross with other breeds for stock improvement. Texas Longhorns are descended from the first cattle brought to the Americas by Europeans -- by Christopher Columbus, no less. In addition to their Spanish blood, they also descend from English breeds brought to the East Coast by early settlers. It's possible that the long horns came from English longhorn Herefords, and some of the colors from short-horned Durham cattle. However, a leading Longhorn historian believes that the breed consisted of approximately 80 percent Spanish blood and another 20 percent of "mongrel" stock. 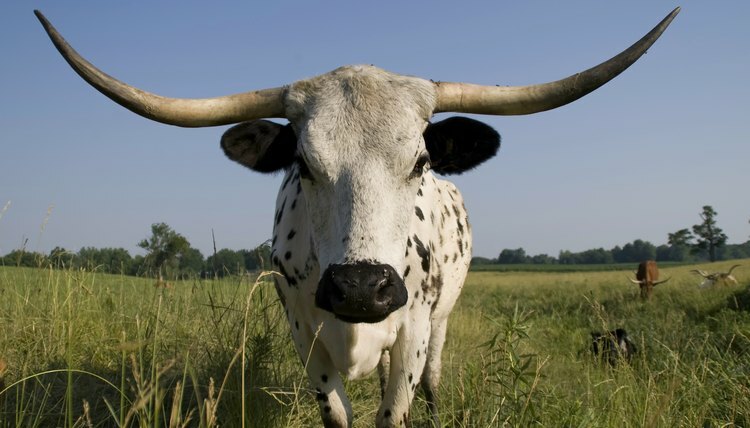 By the late 19th century, most of the country's huge cattle population had some Longhorn influence. The show standard for the Texas Longhorn describes the breed's color as "more varied than those of the rainbow." No two Texas Longhorns look exactly alike when it comes down to coat pattern. Those patterns aren't subtle, and "flamboyant" and "loud" are part of the judging standard. Longhorns are pigmented around their eyes. Their tails are long, and boast full switches. The Longhorn should appear rugged, but that ruggedness reflects general soundness of body and hoof. Males and female Longhorns both sport horns, although horns vary in shape according to gender. A bull's horns are usually straight, turning a bit at the end. A cow's horns appear in a greater variety of sizes and shapes. While a cow's horns measure up to 40 inches in length at maturity, a bull's horns grow up to 46 inches. Calves begin sprouting horns by the age of 3 weeks, and the horns continue growing throughout the animal's life. Growth does slow as the Longhorn ages. Texas Longhorns are among the most fertile of beef breeds. It's not unusual for Longhorn cows to produce calves into their late teens and even twenties -- unheard of in most other breeds. They also achieve puberty earlier than other bovines. A Longhorn cow's basically tough constitution and ability to thrive on relatively little forage also allows her to calve easily and efficiently. Not all longhorns hail from Texas. The English Longhorn -- also known as the Lancashire and Warwickshire, among other local names -- was once among the common breeds in Britain. Today, they are an endangered breed, brought back from the brink of extinction by the Rare Breeds Survival Trust. Unrelated to the Texas Longhorn, the English Longhorn has a white back and a red, brown, gray or brindled body. The latter is a lighter base coat with dark striping. English Longhorns are renowned for the high butterfat content of the their milk, along with calving ease and general longevity.